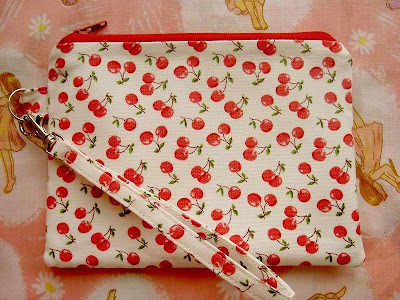 There are quite a number of good zippered pouch tutorials already in the internet. 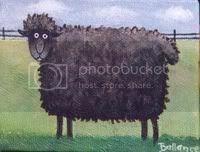 There's one in Craftster, Twelve 22.org, Bored and Crafty, Henrietta's Handbags , U-handblog, among others. I had attempted to follow these tutorials twice in the past and in both attempts, failed miserably. Why so? It was simply because, up until recently, I did not have a zipper foot...a real must in this kind of project. Why make another tutorial then? I am happy to say I have found an easier way to make the zippered pouch. While the whole process is only slightly modified, I have eliminated a couple of steps and have also done away with the need for a zipper foot! These were made possible, firstly, by using the same fabric for the outer bag and the lining and secondly, by using a slightly longer zipper. 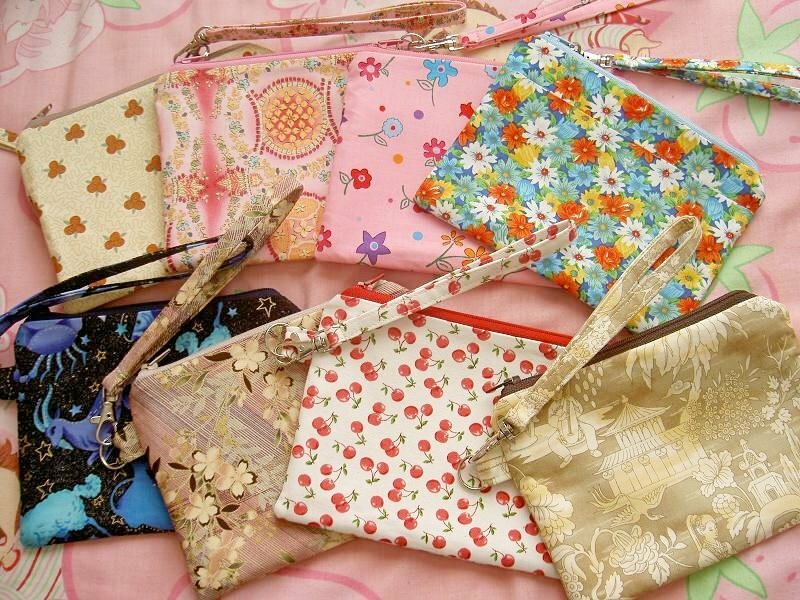 For inspiration, here are the zippered wristlets I have been working on these past few days. Aren't these lovely? So easy to sew, very inexpensive to make, great to use your fabric scraps on and would certainly be appreciated as handmade presents! 1. Fuse your interfacing to your fabrics. 2. 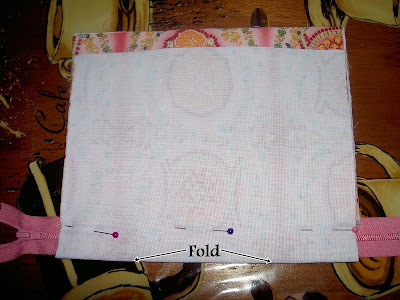 Fold one of your 11 1/4" x 7 1/2" fabrics in half, right and short sides together. Press well on the fold. 3. 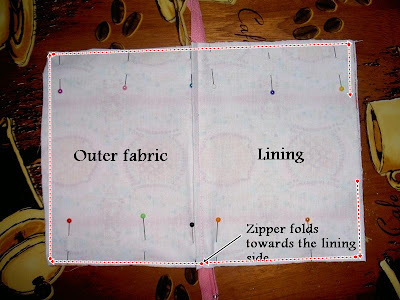 Insert your zipper inside your folded fabric in the manner shown in the photo below. Pin zipper in place. Zipper is right side up with zipper pull on the left side. Fabric is centered between the ends of the zipper. 4. 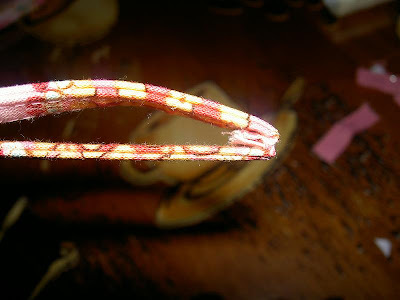 Stitch zipper to the fabric, approximately 1/4" from the fold. Place your needle position at its leftmost. As you can see from the photo, the left edge of your basic presser foot is side by side with your zipper teeth. 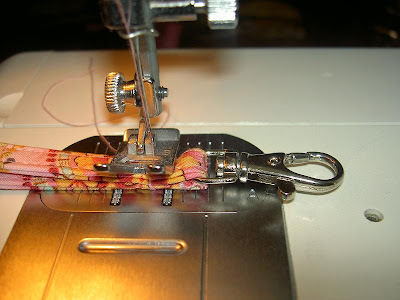 This way, you are actually using the zipper teeth as a guide to stitching straight. 5. Open your folded fabric to its right side. 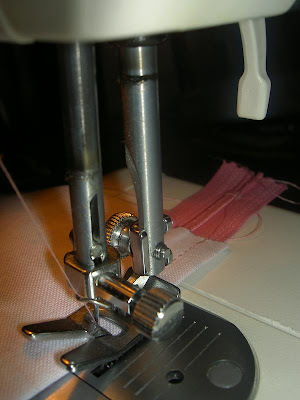 Press well away from where you had stitched the fabric to the zipper. 6. Fold your other 11 1/4" x 7 1/2" fabric in half, again right and short sides together. Press well on the fold. Insert the free edge of your zipper on the fold, again with its right side up and the zipper pull on the left. Align the left and right edges of your fabrics. Pin in place. You should now have four layers of fabric. 7. Stitch zipper to second fabric in the same manner as in step 4. 8. 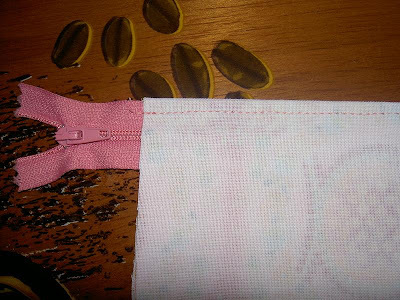 As in step 5, open your second fabric to its right side and press well away from the zipper. You will now have two layers of fabric on each side of your zipper. 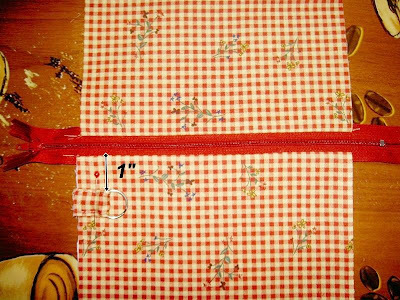 Optional topstitching can be done as indicated by the broken red lines. 9. Open your zipper at least halfway. With right sides facing, bring together the top layer of fabrics on each side of the zipper. Move these to one side. This will become your outer bag. Do the same for the two bottom layers. Move these to the opposite side. This will be your lining. Pin the fabrics in place. The zipper should naturally fold towards the lining side. 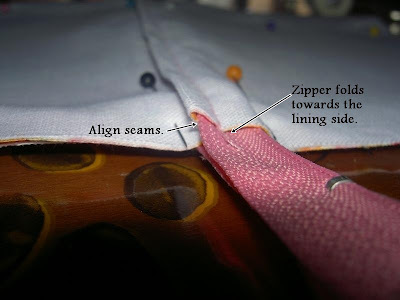 Start pinning near the zipper, making sure your seams are aligned. 10. Starting from the center, stitch all around using a 1/4" seam allowance. Leave a 3-4" gap in the lining bottom. 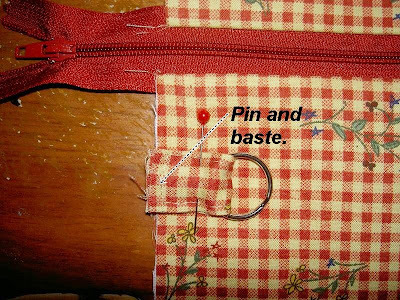 Cut off the excess zipper and clip the corners. 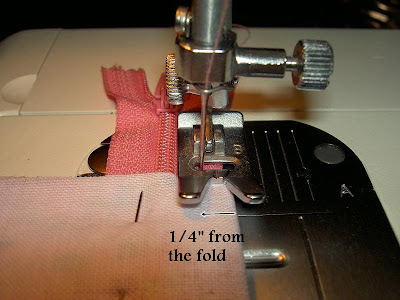 Tips: 1) When you get to the lining bottom, increase your seam allowance slightly (by about 1/8"). 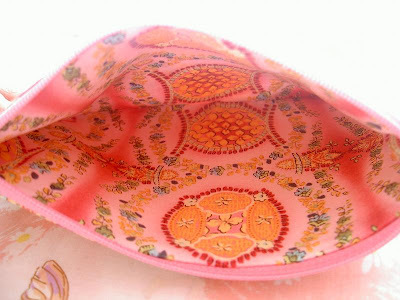 This will make your lining nice and neat inside your pouch. 2) As you will be cutting off the excess zipper, backstitch a few times over the zipper ends for extra strength. 11. Turn your bag inside out by first pulling out the outer bag through the zipper opening and then out the lining opening. Push the corners out well. It is good to press your bag at this point. 12. Slipstitch the opening closed. Push the lining inside the pouch. 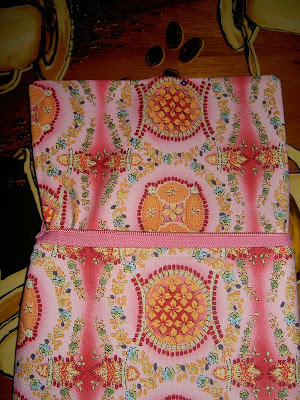 Your zippered pouch is now done! 1. Center the interfacing in your 14" x 1 1/2" fabric strip such that 1/4" of fabric is not interfaced on both the short sides. 2. Fold the long edges towards the center. Fold again lengthwise to end up with a 3/8" wide strap. Stitch all around close to the edges. 3. Slip the swivel hook inside the strap. Bring the raw edges together and stitch 1/4" from the edge. 4. Turn the strap over such that the seams on the side you just stitched are now in the inner loop of the strap. 5. Slide the swivel hook over to the stitched side. 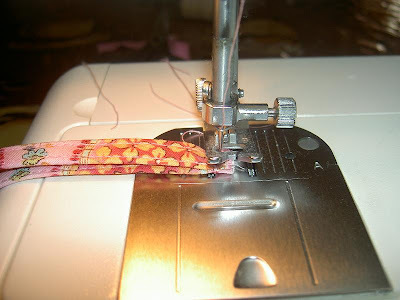 Stitch across the strap to hold the swivel hook in place. Backstitch several times. You can attach the hook directly to the zipper pull or you can use a d-ring strap attachment, as shown below, to attach your strap to your pouch. 1. Fold your fabric strip, shorter sides towards the center. Fold again lengthwise to end up with a 3/4" wide strap. Stitch down close to the edges. 2. Slip your strap into your d-ring then bring the raw edges together. 3. After completing step 8 in the main tutorial, pin and baste your strap attachment to your pouch, as shown in the photo below. 4. Proceed to the rest of steps in the main tutorial.Once again, I do hope the tutorial was clear enough to follow. Ask away if you have any questions. 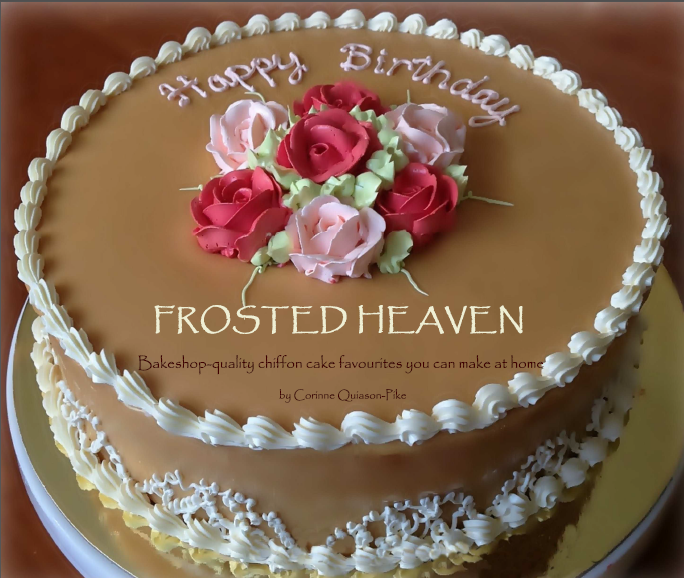 I am having so much fun making these....wish you will, too! nLove, love, love your tutorial! I can't wait to make some wristlets to accessorize with my outfits! You did a great job. Thank you! Really Fast and easy! Can't wait to try it! Very clever! Your methode seem so simple and yet very effective. I will have to try it after I had a wee go at your city bag pack. Thanks so much for the tutorial! I've always wanted to make a purse with a zipper, and with your help, I finally feel brave and prepared enough to try! Oh Thank you. I can't tell you how many zipper pouches I have tried and walked away from after making a mess and I even have a zipper foot I just made one and it turned out great! Thank you Thank you! I added a little sewn in wrist strap. I will be making many more of these. Thank you for sharing your work. Hi I blogged the little pouch I made using your tutorial. I linked to your tute as I know I will need it again! Thank you again! very cute. I was wondering if you had a pattern for a regular wallet. One with the slots for the cards. I recently held a birthday party for my 13-yr-old daughter. There were 10 girls and they each made one of these, without the wrist attachment to the zipper. They came out great! Thank you so much for posting your instructions. Thank you shooooooooooooo much. I was exactly looking for this kind of pouch & detailed instructions. Since I'm a beginner and that would my first time to attach a zipper. Once again thanks for this amazing tutorial. The girls have their own little shop to come and get items for their projects.. great quality time for all of us..ages 35 to 15 yrs old. Now, I am looking for a tutorial on how to stiffen fabric to make fabricpaper for an Origami project any suggestions? This is great! Next week we are doing a workshop of pencil cases and/or toiletry bags (same thing really), and we need to have it really simple. This is exactly right. Thanks so much. I wonder how many longish zips we have. Thanks so much! I had a stash of 10 cent- 6 inch zippers that I needed to use! I wanted to offer a suggestion on the fob. I pressed my fabric and unfolded it and then slipped the ring through. THEN I sewed the 2 short ends together and then refolded the fabric and sewed the edges being careful not to run over the ring of course. This way the raw edges are completely encased and there is less bulk to sew over. I hope this is clear. 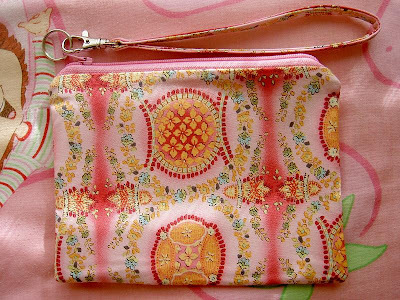 I just used this to make a matching wristlet from the leftover fabric from a dress I shortened. It was difficult bc the fabric was stretchy- but even though I shoved it through the machine, it is beautiful! I am so excited I made it! I am going to have a girls night party and teach my friends how to do it! Thanks for the tutorial very efficient,my wristlet turned out very neat and plan on doing more. 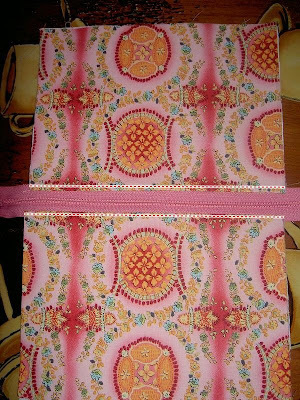 Just came across your tutorial, and it is a great way to make these with finished seams! It vas werry nice little bag. 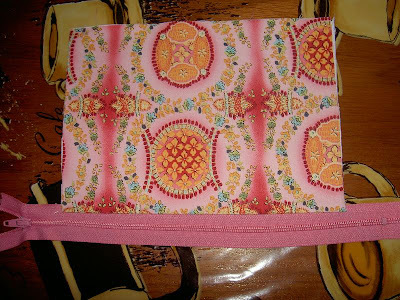 I just finished making a wristlet using your tutorial. The directions and pictures made it so easy! My wristlet turned out amazing! Thank you! Thank you for this great tutorial! Just came arround here, looking for ideas for a little selfmade gift for my friend. It will be a great help with the zipper ;O) .... just wanted to make a littel thing like this for my friend who starts working as a teacher again. Thank you so much Kababayan! Madali kong naintindihan ang tutorial mo. Nakagawa ako. Thank you for your tutorial and your blog. 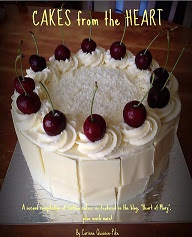 I find it interesting and the recipes look yummy. Don't worry about being interesting, it is to people who like to read and sew and cook. I will try some of the recipes and tutorials on several. I like the messenger bag, backpack and wristlet so much! Thank you so much for posting a tutorial that actually looks EASY!!!! Hopefully i will be able to follow your steps to make one of these! thanks from Mel's Designs that you posted this interesting bag...I'm going to try to make it for Christmas gifts this year....Mel.. This tuturial is fantastic! I came across it via Pinterest and I've made several pouches in various sizes and colours--from a small coin purse to a larger cosmetic bag. I am experimenting with adding pockets; I've had success with adding an outside pocket, but I haven't quite figured out how to do an inside pocket nicely. 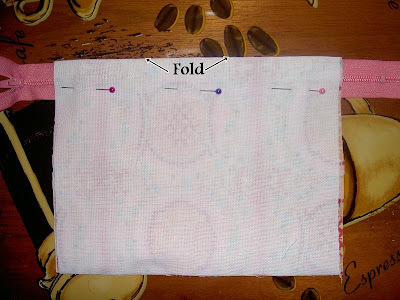 To get the outside pocket, I fold over a piece of coordinating fabric, right sides out. When folded, it is the same width and about 1/4" shorter than each of the main pieces. In step 9, I pin this piece in between the two outer pieces, fold should be zipper side up and 1/4" away from the zipper. The other edges should all line up perfectly. Proceed with the rest of the instructions. Thank you for taking the time to do this tutorial! My Very First Giveaway...Softie Up for Adoption!